I’ve nominated author Kerry Donovan for Kindle Scout – will you? 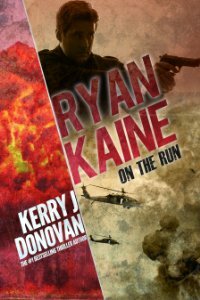 Author Kerry Donovan has a new book Ryan Kaine: On the Run enrolled in the Kindle Scout program. If you’re not familiar with this, authors apply to have never-been-published works enrolled, and readers are invited to nominate books for a Kindle Publishing contract on the basis of sample chapters. Here’s the link for Kerry Donovan’s book. I was lucky enough to read the whole manuscript this week. Being a Kerry Donovan fan, I wondered what to expect from the author’s first venture into the action thriller genre. Tough, handsome hero with a will of iron, deadly training, and the propensity to kill on demand? Well, sort of, except that Ryan Kaine is more than the one-dimensional cut-out figures that blast their way through the paperbacks on sale at airports; he’s got buckets of morality and an urge for redemption. And what a pleasant surprise to meet a couple of old friends from Donovan’s D.C.I. Jones series along the way. I won’t reveal any more, other than to say that Ryan Kaine: On the Run is a romp of a book that leaves a sense of satisfaction rather than a sugar hit. Have a look at the Kindle Scout link (here it is again), and if you like what you see, give Ryan Kaine your vote. Stuart Campbell’s Cairo Mon Amour will be published by Austin Macauley Publishers in the second half of 2017. Thanks Stu, you are a star.